Quickly, easily, and efficiently portion sweet sugar, fluffy flour, rich, decadent chocolate chips, and trendy quinoa with this Tablecraft 724C 1/2 cup stainless steel measuring cup! Metal measuring cups, such as this one, boast great durability while creating a nostalgic feel. Use it to measure dry ingredients in your bakery, restaurant, cafe, or bistro. It's perfect for measuring rice, breadcrumbs, and pasta, as well as oats, barley, and beans, too! The durable stainless steel construction ensures longevity and easy cleaning, while rounded edges guarantee safety, minimizing the threat of unfinished edges. Nice sturdy stainless steel measuring cup. Very good quality and a very good price. We have all sizes of these Tablecraft items in our bakery. These measuring cups are very sturdy and made of good steel material. We use ours all the time and they work great and do not rust even after daily washes. Perfect measuring cups to have on hand for dry ingredients. I bought several of these to keep in containers for easy access and use. They are also priced nicely. I purchased several of these measuring cups for home use. I love that I was able to purchase individual sizes. I also like how sturdy each cup feels. It's a basic 1/2 cup measuring cup. Cheap enough that you won't care when it bends or breaks, which is good because the handle is incredibly thin on these. This is a great, inexpensive measuring cup. It has both the cup and ml measurements on the handle for convenience. It is also dishwasher safe. I really like the material this is made from. There is no bend or give and products come out clean. Because its flat and its metal they are easy to level off. great half cup measuring cup-- stacks well and washes (in the dishwasher with mild soap) pretty well! Together with the rest of the Tablecraft measuring cups, it fits well in a small drawer! I use this for portioning dried toppings for my cinnamon rolls at my store including nuts and cereal as well as reesee’s pieces. They are wide and the handles are fat and easy to handle. I'm a home based baker and I use these in all my containers. Great for flour, sugar, etc. They after very sturdy, and I would purchase again. This measuring cup is a bit thin and can bend easily, however it is a good value for the price. No fancy measuring cups needed! This is a great measuring cup. I'd love to be able to have as many as I wanted of these items, and I can because of the price! The 1/2 cup measuring utensil is amazing. Its so well made and accurate. I love it. I use it for measuring anything from butter to rice and milk for different recipes. A must have! I love this stainless steel measure cup by Tablecraft. A great measuring cup with a ring hole so that it can be added to a ring to creat a whole set! Made of stainless steel, this Tablecraft brand measuring cup holds a 1/2 cup or 125 ml of ingredient portion size. Using a level, it is easy to make an accurate portion prior to serving. Tablecraft always makes good products. They are a brand that we have trusted for years and they have never let us down. We are so happy with our purchase. They go great in our kitchen. Really nice measuring cup. The stainless steel is durable and made to last all while being easy to clean. I prefer to use these most with dry ingredients in large bags or bins as it is easy to scoop. The Tablecraft 1/3 Cup Stainless Steel Measuring Cup is an excellent product. It is good for measuring dry grocery items and easy to wash. The quality is very good, especially for the low price. I can’t say enough good things about this like of measuring cups. They feel sturdy and are made of stainless steel. The measurements are clearly listed and visible on the handle. This is a great value for the price! We always recommend using staleness steel measuring cups instead of plastic. They will hold up better to frequent use and are easier to clean. We have used a metal ring to connect all 4 of the measuring cups in this line. This helps them stay together when in our catering supplies. The Tablecraft 1/2 Cup Stainless Steel Measuring Cup is a well made and sturdy measuring cup. It is highly accurate in measurements. Recommended for commercial or residential use. the difference between a good stainless steel measuring cup and a plastic one is like night and day. they are great and the quality is amazing. very happy with this half cup size. This was a valuable addition to my my measuring cup collection. Glad there's a hole in the handle so I can hang it in my cupboards. The stainless steel 1\2 cup is very used everyday in my bakery. It's strong design allows me to easily scoop my coconut oil. I might be needing more! Perfect for dry ingredients, but I prefer the clear polycarbonate ones for liquid ingredients. The handles have held up fine so far, but I prefer one-piece designs. No more constantly breaking plastic measuring cups. This stainless steel cup is as good as it comes. It is very strong and durable but inexpensive as well. My most used one, 1/2 cup is used several times an hour here, so naturally the Tablecraft 724C 1/2 Cup Stainless Steel Measuring Cup was a smart purchase, thank-you! They are almost impossible to break. I love the stylish design. Well crafted and I really appreciate the weight and how easy they are to clean. The stainless steel measuring cups are absolutely amazing. I will never go back to using hard plastic ones again. Great quality and literally you cannot beat the price! Solid constructed measuring cup. Good to buy separately for repeated use in measuring one item from a larger stock. Highly recommend a couple of these measuring cups for all kitchens. These 1/2 cup measuring cups are great! They are in both my commercial and home kitchen, and they work well after repeated washings and uses. The Tablecraft 724C 1/2 Cup Stainless Steel Measuring Cup definitely met my expectations. I love these measuring cups! The quality is great and the price is very reasonable. I highly recommend the measuring cup. Great stainless steel design combines classy elegant looks with good functionality and design with this product. This is the size that I use most often! This Tablecraft 724C 1/2 Cup Stainless Steel Measuring Cup is perfect to measure your ingredients. They are very well made and very easy to identify with the marking clearly showing on the handle. I strongly recommend this measuring cup. Tablecraft 1/2 cup Stainless Steel Measuring Cup Can be trusted for the brand. This cup measures 1/2 cup and made from stainless steel. 4 stars quality and price! By far my favorite stainless steel measuring cups. I like that the size of the cup is engraved ensuring there will be no guessing of the size of the cup. This is a great measuring cup! I use 1/2 cup a lot and it works great. It's pretty sturdy doesn't easily bend! Love that it has hole at end of handle for hanging. This is your standard measure cup for a price that's cheaper than what you would find at a store or an online retailer. The stainless is good quality and should last many years. I was so happy to find this! We use the 1/2 cup size measuring cups much more often than the other sizes, but we usually end up just getting extra sets and throwing away the other sizes, so this is fantastic! This might be my most used kitchen item right now. It is a perfect 1/2 cup measure. It cleans easily and without color changes. It also stacks nicely. 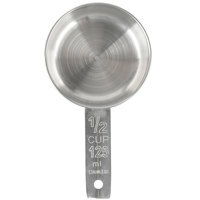 Metal measuring cups are the way to go because the size is inscribed and won't ware away. Easy to wash and very very durable. Love these things so I'll keep ordering them as needed. This 1/2-cup stainless steel measuring cup has been great for getting the right food proportions with meals, like cereal and granola in the mornings. The solid design has caused me to throw away my other cheap ones. I definitely recommend this and other table craft products for use in the kitchen! The Tablecraft 1/2 cup measuring cup can be used along with other Tablecraft cup sizes. The measuring cup is nothing fancy, but is sturdy and affordable, gets the job done. Can be used with dry and liquid ingredients, i like to use them as scoops in jars of dry ingredients. We routinely use 1/2 cup measuring spoons, but we needed to really upgrade to the cups as they are much easier to wipe out, clean and most of all hang on hooks in our small kitchen. Now I bake and cook almost every day of my life and I have many measuring cups. BUT I love these the most! Easy on the eyes, easy to clean, I have had about 4 of the 1/2 cup for over a year... no rusting and they are still like new! We ordered this for our restaurant. We use it for daily prep. It is sturdy and is a good addition to other measuring spoons we already had. We will order it again if the need arises. Tablecraft 724C 1/2 Cup Stainless Steel Measuring Cup is a great little cup. It is nothing fancy but it is great for spare cups. I have them in everything! I purchased these half cup measures to put inside glass jars in my pantry instead of scoops. Each item has it's own measure, and I am not constantly having to rinse between ingredients. Perfect! This 1/2 cup stainless steel measuring cup can be used in conjunction with the other Tablecraft measuring cups. It is useful when measuring out nuts or chocolate chips. Great product. I foresee these lasting a long time. The handle is securely attached to the cup, and they are very easy to clean. The measurements are etched onto the handle so you don't need to worry about them coming off. I highly recommend these to any home cook out there. While I've had a few other measuring cups in the past that didn't empty well, this stainless steel cup functions well and cleans up really easily. My favorite measuring cup! We use these to measure out portion sizes for all of our half cup serving sizes. Durable, easy to clean, and the displayed measurement will never rub off! I use these in my bulk pantry bins. Assign each bin a different size depending on the contents. Larger size for grains, this size for seeds and nuts. I really like the Tablecraft 724C 1/2 Cup Stainless Steel Measuring Cup we bought. It is a big step up from the shoddy plastic one we had before. Excellent quality and build. This stainless steel measuring cup cleans up quickly and is a great value for the price. We expect these to last a long time but in the short time we've had them, we already have our moneys worth. Would buy again and recommend them to other businesses, family, and friends. Very durable for the price. The handle can bend if you are scooping very hard stuff but other than that its very strong and easy to clean. I like this 1/2 cup stainless steel measuring cup. It is good quality, and washes well. You get exactly what you would expect. Overall, I would recommend this product. I am not sure if the design has changed since I purchased mine, but the top edge of mine has a small lip that I don't see in the current product photos. I don't have a problem with the lip, but found it interesting. Based on what I have, I think these are fantastic for the price. I do have other much sturdier and heavier measuring cups, however I reach for this style most often because they are comfortable to use and not too heavy. The handle is somewhat thin, but they have not bent out of shape or broken off. I keep one designated in my sugar container at home and it has held up great. Portion control is essential to running a profitable restaurant. You should be using these for any shredded cheeses or diced line ingredients. Don't tell your staff just use half a scoop or two scoops. Just buy the right size for one scoop. Super easy to clean and well made! You can scoop the mess right out or wash and hang to dry. 1/2 cup measuring cups are our second most used utensil so It is important we have functioning ones on hand. These cups are a must for every kitchen...the stainless steel is very sturdy and stainless steel cups cleans up so much easier than plastic measuring cups. Good quality stainless steel measuring cup. solid value for the price. the handle is pretty flimsy and could easily bend or break because of how weak it is. as long as you're not rough with it you should be fine though. Not impressed with this product, very flimsy, the handles broke off all of the ones we bought in no time. I know the price is low, but you'll want to spend a little more for better quality. Very heavy duty measuring utensil for a reasonable price. They are accurate on measuring out the ingredients and look professional. Great measuring cup by table craft. I needed several 1/2 cup measuring cups to use in different containers of flour. The price is very good and these do the job. I wish it was made a little heavier- but still an okay buy. Even though this intended for the dried parmesan cheese, I am using it for a tomato powder / herb blend and the holes in the lid are big enough to accommodate. Neat little measuring cup. We use these the measure all sort of things. I love the quality and the stainless steel feature. I am sure these will be around for quite some time! I use these as a stationary measuring cups for baking items such as flour and sugar. Although not heavyweight and solid in construction, it works great. For the price, I would not hesitate buying these again. I bought a 7 of these to go in my gallon glass containers for flour, sugar, oatmeal, rice, beans, etc. Makes it so much easier to measure ingredients without having to find the measuring cup in the drawer. I've been using these for a few years now and they have held up wonderfully. The price us amazing and I love that you can buy whichever size you prefer. In my next order I will be ordering the 1/4 measuring cups for my smaller glass containers. A nice weight. These seem to be exactly like the cups we had when I was growing up, and those have lasted decades. We purchased several and leave them in the different flour containers (some 1/2 cup, some 1 cup, depending on how much we regularly use of that flour) instead of scoops. Sturdy, affordable, useful. Not only can it be used for measuring, but a great scoop to keep in dry ingredients like flour, sugar, rice or beans. At Harmony Cafe, we offer an array of sandwiches, salads, wraps, etc. To help our presentation be consistent and maintain food cost, we opted to utilize this measuring cup to portion products. It's nice that this cup is not sold in a set because a 1/2 cup can be used for 1/4 and 1 cup measuring also. Fair quality, low price.